Please study the aerial view of the landscape from sea level, north to The Dakota Ridge Cross-Ski Recreation Area, across the slopes from Sechelt to Roberts Creek. Note this Google derived photo doesn’t include the 2013 logging of The Wilson Creek Forest or TrailFest-Wagon Forest. 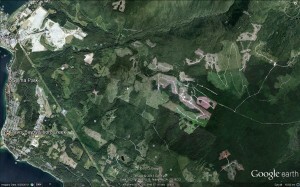 There is certainly much to look at in this heavily impacted landscape, from urban development, gravel pit mining – to logging. Some of the largest clearcuts in the Province appear – the CNI and Western Forest Products cuts. Add the many other cutblocks completed by SCCF and BCTS and most would agree its a severely fragmented forest landscape. Yes, forests do grow back, however when they do, they’re cut down in 60-80 years, that’s the business of industrial logging. The complex bio-diversity that once permeated these older forests is lost forever leading to a draw down of species and natural wealth. Is it any wonder that Elders from all walks of life, who have the historic perspective of what these forests used hold under their canopies, will express “Oh My God” when yet another cutblock is approved? There is no higher Land Use Plan on the Sunshine Coast set down by the Province to ensure the best use of all forest values and how they related to the support system that benefits all citizens. An attempt at a land use plan was squashed in the 1990’s with no sign off from participants, leading to the present state of unbridled logging. A February 2013 publication ‘An Audit of Biodiversity in B.C – Assessing the Effectiveness of Key Tools’ from the Office of the Auditor General of British Columbia is a wake up call that biodiversity protection targets are not being met, leading the environment into uncharted waters. The term biodiversity is defined in the report as: “Biodiversity is the variety of life on the planet. It includes species, their genetic diversity and ecosystems. The health of biodiversity is often compared to the heath of the environment and ultimately affects human well-being by supplying us with food, water, air, soil and medicines”. Sunshine Coast MLA, Nichloas Simons, recently stated in The Local newspaper that he supports getting a Local Regional Unit Plan (LRUP) completed. The logging industry that works on the Coast (BCTS, SCCF and Island Timberlands) has several cutblocks planned for 2013-14 period. The blocks will not be integrated into an overall plan – quite the opposite – they are piece-meal, hoping that their operation doesn’t find the other operator cutting before they do on adjacent parcels. Until the LRUP is completed, Elphinstone Logging Focus requests that all cutblocks be put on hold in the Chapman and Howe Landscape Units, including the Elphinstone slopes. This is a reasonable request, considering how much of forest cover has already been lost – case in point: Wilson Creek Watershed up to 90% gone. If this position is not supported by industry, and they log more of the last intact older forests, it is rightfully seen as a timber grab with disregard to what is coming down the pipe. Continued logging will also indicate a lack of understanding that this landscape is facing a dire situation for maintaining bio-diversity levels, including a lack of protection for low-elevation older forests. The Auditor General’s report makes 6 key recommendations – government failing duty to protect the province biodiversity – Click here to view. We thank industry in advance for putting future cutblocks on hold while an integrated plan can be achieved in the next few years. This is the only way that current biodiversity levels can be maintained and we as a community can be assured that the quality of life we have today, will be same or maybe a little better for our children, and their children, and not worse. The Home Planet is entering a critical phase of its history as species extinction ramps up and climate change brings an uncertain future. Where do we begin to save the planet? Right here – on the Sunshine Coast.